Far in the future, an unexplained global cataclysm forced humanity to regress back to being a tribal society at the height of technological advancement. What's left are the remnants of the "Metal World" that's slowly being reclaimed by nature. The cataclysm not only left ancient advanced ruins but also numerous, autonomous machines that roam the wild. While the tribal humans have co-existed with the machines, only occasionally hunting them for parts, a phenomenon has recently caused the machines to aggressively attack humans. This "derangement" phenomenon, along with the appearance of larger, deadlier machines is now a threat to humanity's existence. Horizon Zero Dawn follows the young woman named Aloy and her quest for self-discovery and exploring the intriguing world where nature and technology exists as one. Welcome to Supercheat's unofficial guide to this post-apocalyptic PS4 Exclusive. Please use the menu on the right to navigate the guide. We will feature the complete walkthrough, side quests, collectibles, Trophies, and more. 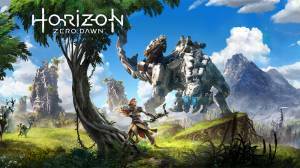 No discussions open for Horizon Zero Dawn at the moment.